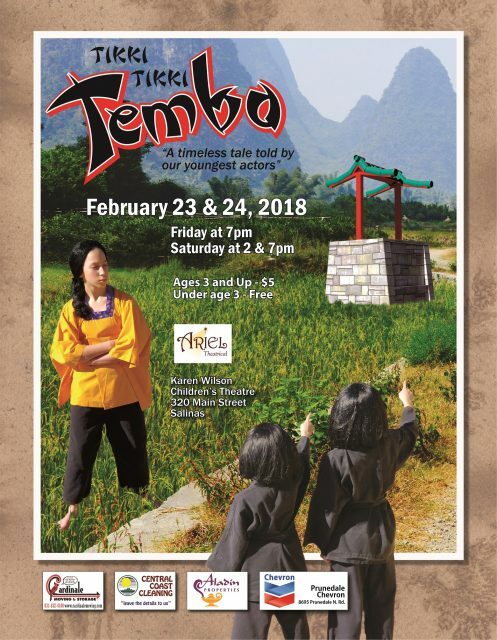 Join us this weekend, February 23 & 24, for a show that is short and sweet, despite the long name! Tikki Tikki Tembo will delight young and old and is the perfect show for the entire family. Tickets are $5 for everyone three and older – under age three is free! Shows will take place at the Karen Wilson Children’s Theatre, home of ARIEL Theatrical. We gratefully acknowledge our show sponsor, Prunedale Chevron and our season sponsors, Aladin Properties, Cardinale Moving & Storage and Central Coast Cleaning. Tickets may be purchased online, by phone at 831-775-0976, or in the box office.